Today, in the age of globalization, the world is undergoing important changes because of increasing economic interrelations, but also due to enormous refugee streams as a result of wars, exploitation, social misery as well as of political and ideological oppression. Are young people prepared to act successfully in a globalized working environment? Will societies benefit from their growing multiculturality or do they risk to burst because of it? Will it be possible to come to human and multilaterally favorable solutions for today’s mass migrations or will the irreconcilable perspectives lead to a fatal confrontation? These are some of today’s most important questions. Whether we will find appropriate answers to them depends most of all on our ability and readiness to deal with cultural diversity – it depends on our intercultural competence (ICC). As ICC is a learnable qualification, it seems to be the duty of the educational institutions today to teach it. But the progress in education policy is usually complicated, ponderous and slow; and trying to harmonize developments of different countries in this field seems all the more to be a titanic task. So, considering this situation, the individual, for example a teacher, may resign – or, in cooperation with others, try to develop just a little project in the field of intercultural learning which could show some makeable ways or at least some ideas, models or strategies that merit to be discussed and perhaps in some regard even to be supported by involved persons and organizations, institutions and media. When the international multimedia school magazine “trait d’union” (“hyphen”) was founded in 2000 by students and teachers of the German School in Toulouse and the Lycée Polyvalent International “Victor Hugo” (both of them located at Colomiers/France) in order to facilitate a practicable project of working together in the field of intercultural learning, the participants realized early, that the structure of this project had to be adaptable to different systems of education. So it was not a philosophical insight, but a simple practical conclusion from the encountered circumstances, that each kind of intercultural cooperation must not try to force unrealistic and loss-making unifications, but be based on the respect for cultural diversity, in this case the diversity of school cultures. This practical insight however was the origin of the project philosophy expressed in the name “trait d’union”: to create as many types of connection as possible between students from different countries in order to propose a multitude of possibilities of coming together and learning from one another. (See: Lothar Thiel, Die Polyvalenz des „trait d’union“-Projekts als Basis seiner Multikompatibilität und Nachhaltigkeit.) The feedback of the participating students, also of some project alumni, of experts and media seem to confirm that this approach was not completely fruitless. Wanting to ensure the sustainability of their common efforts in the field of intercultural pedagogics, a group of French and German teachers from the above-mentioned schools took in 2002 the initiative for an International Center of Intercultural Learning at Colomiers which yet did not come into existence. Despite the changes as to the participating schools and all ups and downs during the following years, the development of new ways to augment students’ intercultural competence remained always the main purpose of “trait d’union”. From 2009 until 2011 the German School in Bilbao, where the author of this text began to work in 2007, coordinated a Comenius Project called “Intercultural Driving Licence”. 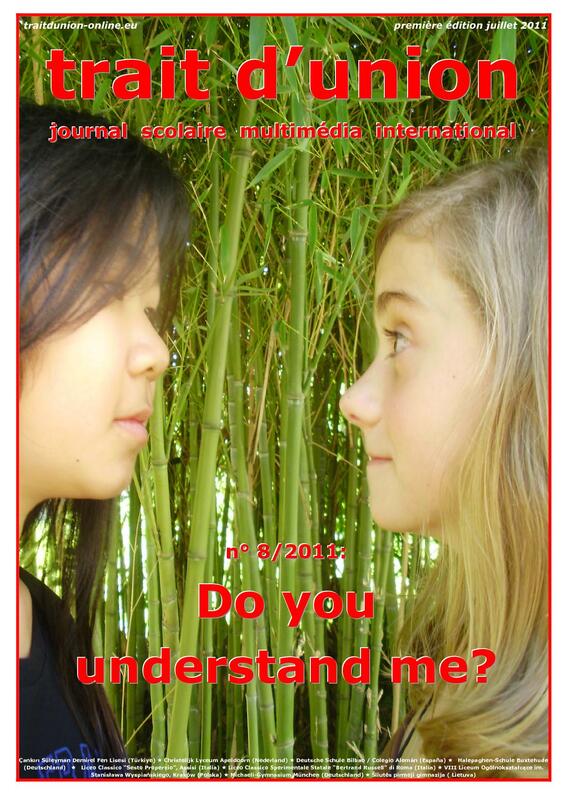 The concept provided, that the students of seven schools from six countries produced the issue n° 8/2011 of “trait d’union” with the general topic “Do you understand me?” (A revised and updated version is being prepared.) To this end they should cooperate during the international editors meetings and by using the newly installed “trait d’union Editorial Office”. This editorial teamwork should be the (basic) level 1 of the project. On the (meta) level 2 the editors should reflect about their experience of positive and the problematic communication and cooperation processes between them and extract a list of intercultural competence elements (best practice respectively common problem solutions). This list should contain in turn the criteria for a certificate of intercultural competence, the “Intercultural Driving Licence”, that each participant could obtain. (See the project aims.) While the product (of level 1) was recognized to be pretty good, the level 2 section of the project has been much too ambitious and therefore it proved to be impracticable. So – in order to ensure that the students got their certificates nevertheless – some of the school coordinators compiled relevant aspects of intercultural competence that emerged during the project. In the last year of that Comenius Project the author of this text was ‘googled’ and then invited to participate as an expert in a Leonardo da Vinci Project (European vocational education project), whose topic should be intercultural competence as a professional qualification. It was coordinated by the Izmir Governorship (Turkey) and included participants from many different sectors: political, economic, scientific, social and educational entities, organizations and institutions from six countries. In compliance with a proposal made by the representative of the German School in Bilbao, this Leonardo da Vinci Project (2012-2014) was entitled “Intercultural Driving Licence | Vocational”, abbreviated by the acronym “Icudriving” (“I see you driving.”). It was a learning partnership project of experts, doing research and exchanging their knowledge and points of view about the most important aspects of intercultural competence, like methods of ICC learning/training, its evaluation and certification. They also investigated opportunities concerning sponsoring and implementation of intercultural competence within different reference systems, especially the European Qualifications Framework. •	What are the concrete elements of ICC? In which way can we describe them? •	How can we obtain a definition of ICC, that applies coherently both for the vocational and the general education? •	In what consist the requirements for a certificate of ICC, that is transparent, individualized and credible at the same time (being this way useful for employers - and therefore for future employees too)? Even if these topics could not be exhausted within the framework of this project, many interesting ideas have been discussed. And the Icudriving partners created an informal network which will design new projects by which one day these questions may be answered. •	What you see is what you are prepared to see.